, an Englishman, eminent for learning and politics, was descended from a gentleman’s family by both parents, and was born at Boughton-hall in Kent, March ^0, 1568. The Wottons were of no inconsiderable distinction, having possessed this lordship for nearly three centuries. Sir Edward Wotton,“our statesman’s grandfather, was treasurer of Calais, and of the privycouncil to king Henry VIII. 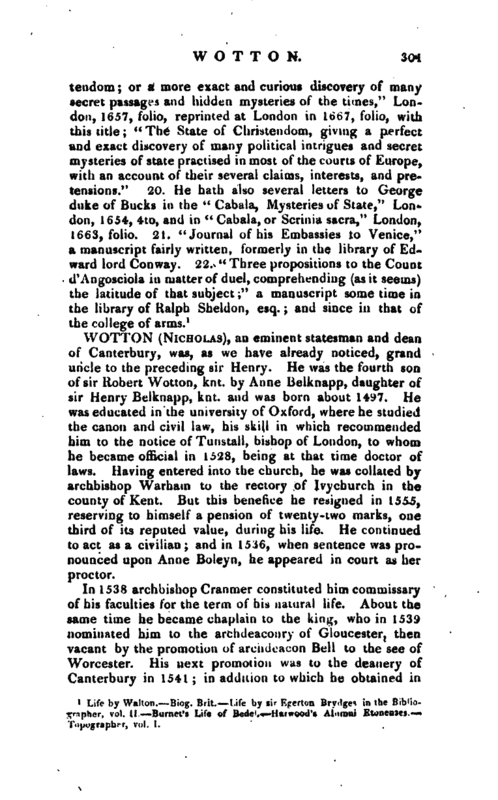 and was elder brother to the celebrated Dr. Nicholas Wotton, dean of Canterbury, the subject of our next article. Sir Robert Wotton, the father of these, was entrusted by king Edward i V. with the lieutenancy of Guisnes, and was knight-porter and comptroller of Calais; where he died and lies buried. Sir Henry’s elder brother, who was afterwards raised by king James J. | to the peerage by the title of lore) Wotton, was in 1585 sent by queen Elizabeth ambassador to that monarch in Scotland; and Dr. Robertson speaks of him, as” a man, gay, well-bred, and entertaining; who excelled in all the exercises, for which James had a passion, amused the young king by relating the adventures which he had met with, and the’obseYvations h,e had made during a long residence in foreign countries; but under the veil of these superficial qualities,“Dr. 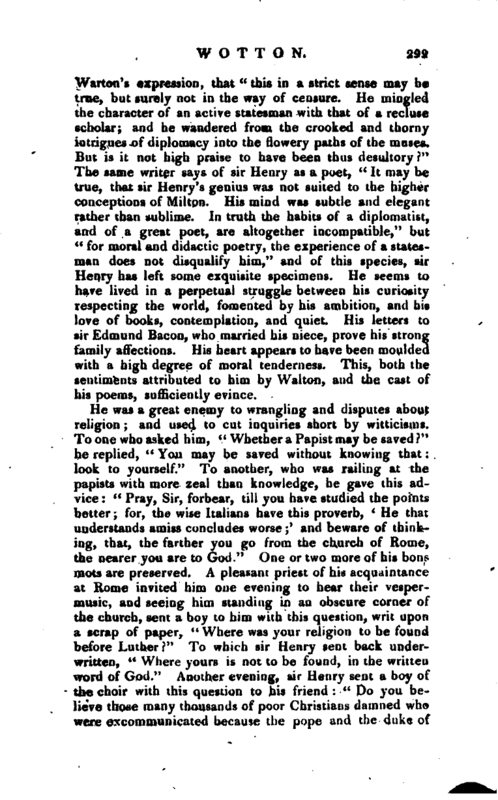 Robertson adds, that” he concealed a dangerous and intriguing spirit. He soon grew in favour with James, and while he was seemingly attentive only to pleasure and diversions, he acquired influence over the public councils, to a degree, which was indecent for strangers to possess." Sir Henry was the only son of the second marriage of his father Thomas Wotton, esq. with Eleanora, daughter of sir William Finch, of Eastwell in Kent (ancestor to lord Winchelsea), and widow of Robert Morton, of the same county, esq. He was educated first under private tutors, and then sent to Winchester-school whence, in 1584, he was removed to New- college in Oxford. Here he was entered as a gentleman-commoner, and had his chamber in Hart-hall adjoining; and, for his chamber-fellow, Richard Baker, his countryman, afterwards a knight, and author of the well known “Chronicle” which goes by his name. 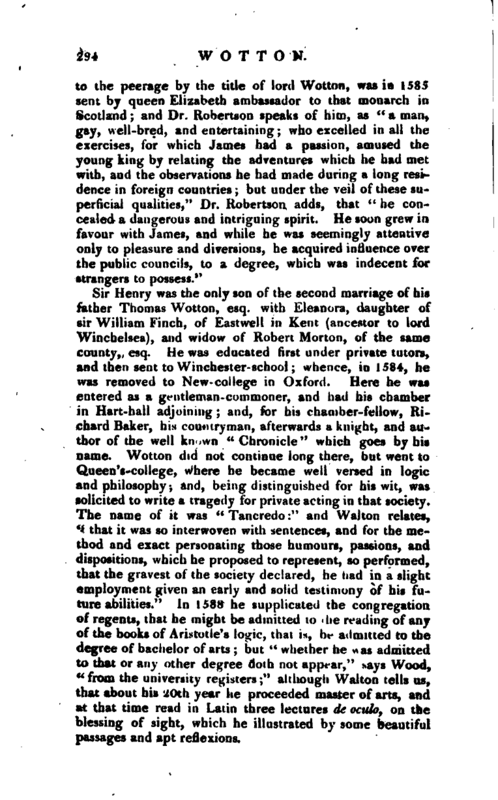 Wotton did not continue long there, but went to Queen’s-college, where he became well versed in logic Uid philosophy-, and, being distinguished for his wit, was solicited to write a tragedy for private acting in that society, The name of it was “Tancredo” and Walton relates, “that it was so interwoven with sentences, and for the method and exact personating those humours, passions, and dispositions, which he proposed to represent, so performed, that the gravest of the society declared^ he had in a slight employment given an early and solid testimony of his future abilities.” In 1588 he supplicated the congregation of regents, that he might be admitted to the reading of any of the books of Aristotle’s logic, that is, be admitted to the degree of bachelor of arts; but “whether he was admitted to that or any other degree doth not appear,” says Wood, ^from the university registers;“although Walton tells us, that about his 20th year he proceeded master of arts, and at that time read in Latin three lectures de oculo, on the blessing of sight, which he illustrated by some beautiful passages aud apt reflexions. | In 1589 he lost his father, and was left with no other provision than a rent-charge of 100 marks a-year. Soon after, he left Oxford, betook himself to travel, and went into France, Germany, and Italy. He stayed but one year in France, and part of that at Geneva; where he became acquainted with Beza and Isaac Casaubon. 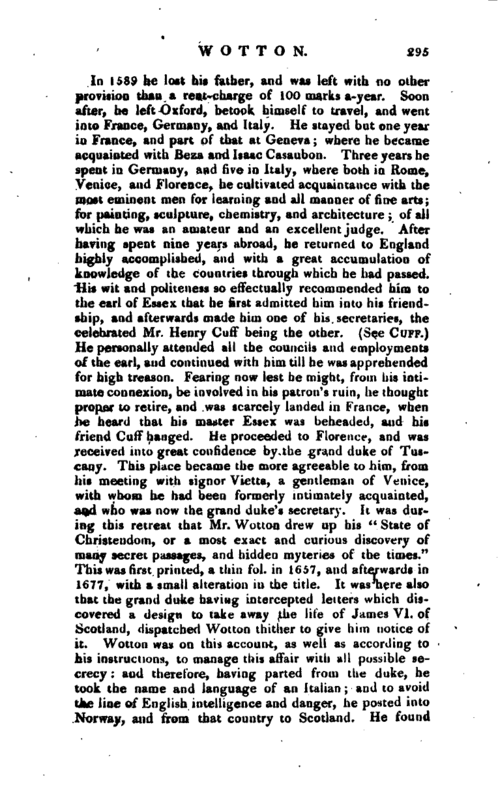 Three years he spent in Germany, and five in Italy, where both in Rome, Venice, and Florence, he cultivated acquaintance with the most eminent men for learning and all manner of fine arts; for painting, sculpture, chemistry, and architecture; of all which he was an amateur and an excellent judge. After having spent nine years abroad, he returned to England highly accomplished, and with a great accumulation of knowledge of the countries through which he had passed. His wit and politeness so effectually recommended him to the earl of Essex that he first admitted him into his friendship, and afterwards made him one of his secretaries, the celebrated Mr. Henry Cuff being the other. (See Cuff.) He personally attended all the councils and employments of the earl, and continued with him till he was apprehended for high treason. Fearing now lest he might, from his intimate connexion, be involved in his patron’s ruin, he thought proper to retire, and was scarcely landed in France, when he heard that his master Essex was beheaded, and his friend Cuff hanged. He proceeded to Florence, and was received into great confidence by the grand duke of Tuscany. This place became the more agreeable to him, from his meeting with signor Vietta, a gentleman of Venice, with whom he had been formerly intimately acquainted, and who was now the grand duke’s secretary. It was during this retreat that Mr. Wotton drew up his” State of Christendom, or a most exact and curious discovery of many secret passages, and hidden myteries of the times." This was first printed, a thin fol. in 1657, and afterwards in 1677, with a small alteration in the title. It was here also that the grand duke having intercepted letters which discovered a design to take away the life of James VI. of Scotland, dispatched Wouon thither to give him notice of it. 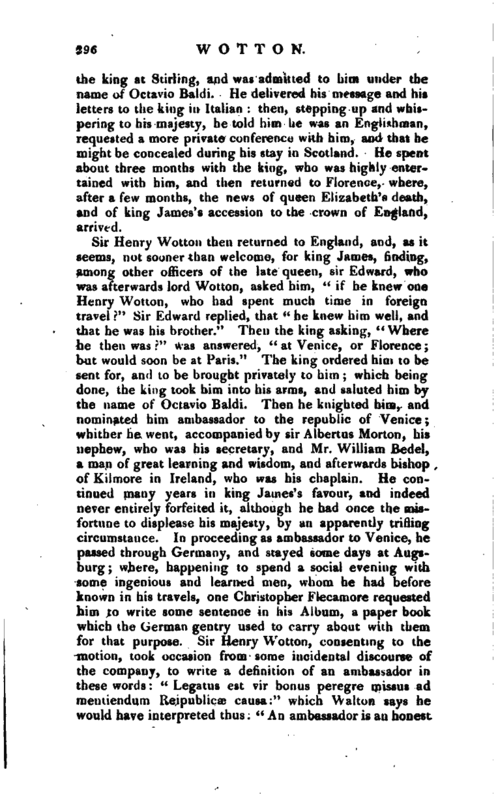 Wotton was on this account, as well as according to his instructions, to manage this affair with all possible secrecy: and therefore, having parted from the duke, he took the name and language of an Italian; and to avoid the line of English intelligence and danger, he posted into Norway, and from that country to Scotland, He found | the king at Stirling, and was admitted to him under the name of Octavio Baldi. He delivered his message and his letters to the king in Italian: then, stepping up and whis^ pering to his majesty, he told him he was an Englishman, requested a more private conference with him, and that he might be concealed during his stay in Scotland. 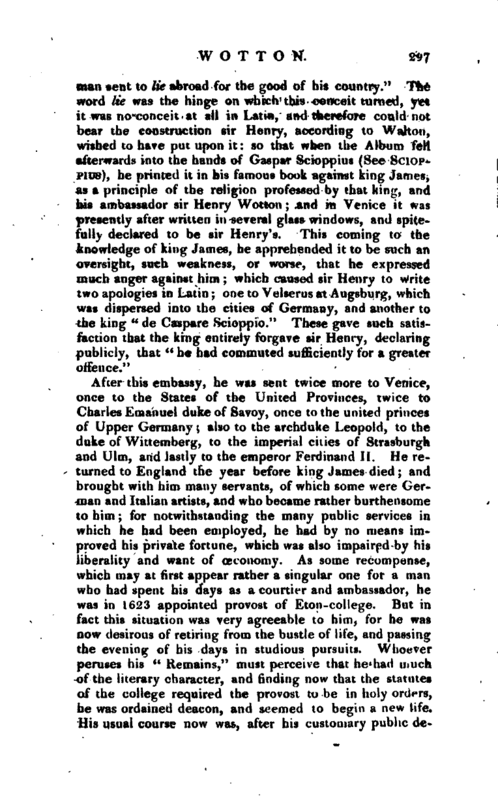 He spent about three months with the king, who was highly entertained with him, and then returned to Florence, where, after a few months, the news of queen Elizabeth’s death, and of king James’s accession to the crown of England, arriyep!. 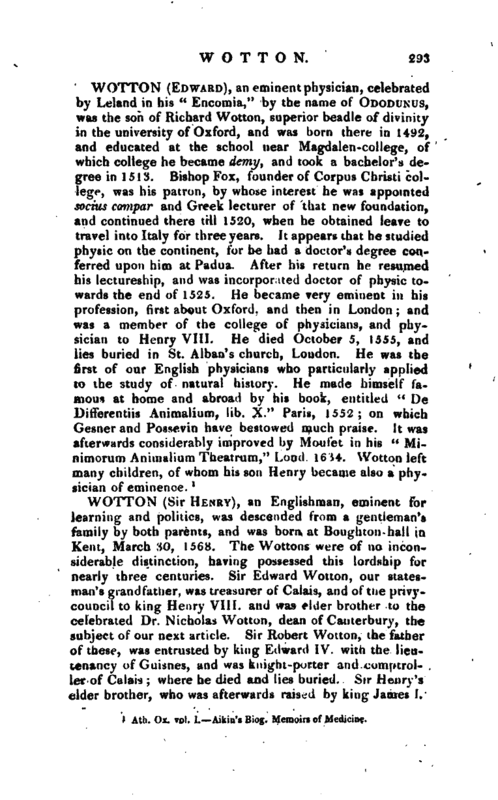 Sir Henry Wotton was a man of eminent learning and abilities, and greatly esteemed by his contemporaries. His knowledge was very extensive, and his taste perhaps not inferior to that of any man of his time. Among other proofs of it, he was among the first who were delighted with Milton’s mask of Comus; and although Mr. Warton has pronounced him to be “on the whole a mixed and desultory character,” he has found an able defender in a living author of equal taste and judgment, who observes on Mr. | Warton’s expression, that “this in a strict sense may be true, but surely not in the way of censure. He mingled the character of an active statesman with that of a recluse scholar; and he wandered from the crooked and thorny intrigues of diplomacy into the flowery paths of the muses. But is it not high praise to have been thus desultory?” The same writer says of sir Henry as a poet, “It may be true, that sir Henry’s genius was not suited to the” higher conceptions of Milton. His mind was subtle and elegant rather than sublime. In truth the habits of a diplomatist, and of a great poet, are altogether incompatible,“but” for moral and didactic poetry, the experience of a statesman does not disqualify him," and of this species, sir Henry has left some exquisite specimens. He seems to have lived in a perpetual struggle between his curiosity respecting the world, fomented by his ambition, and his love of books, contemplation, and quiet. His letters to sir Edmund Bacon, who married his niece, prove his strong family affections. His heart appears to have been moulded with a high degree of moral tenderness. 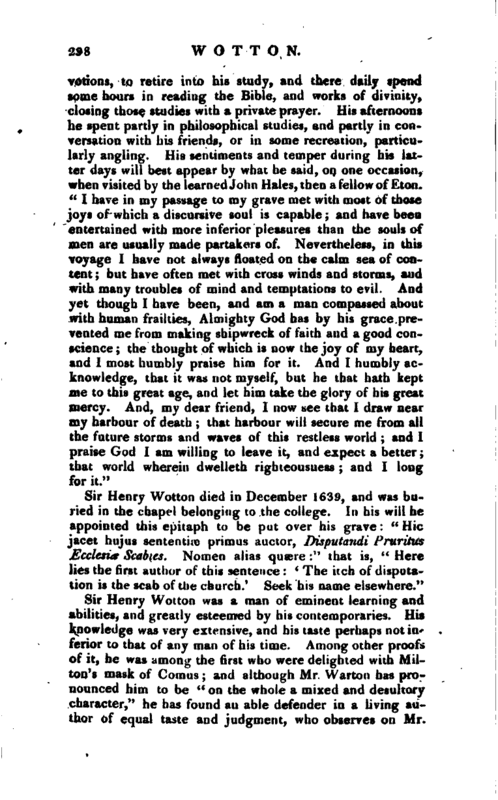 This, both the sentiments attributed to him by Walton, and the cast of his poems, sufficiently evince. Sir Henry Wotton had proposed, after he was settled at Eton, to write the “Life of Martin Luther, 7 ’ and in it” The History of the Reformation,“as it was carried on in Germany. 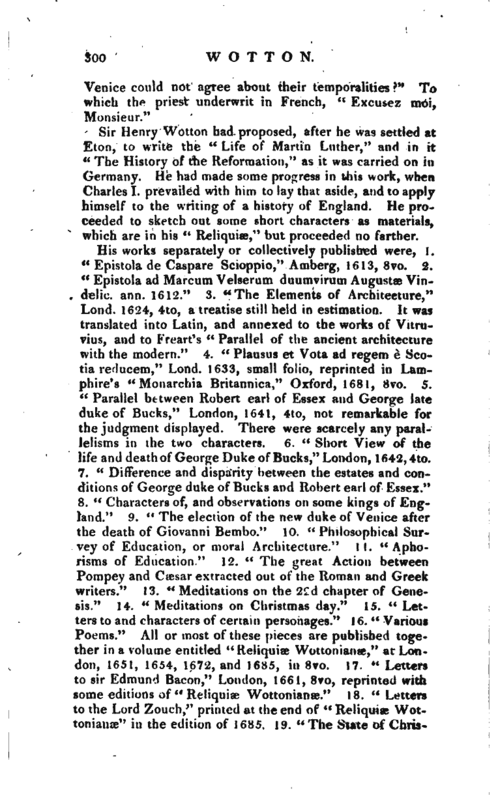 Ho had made some progress in this work, when Charles I. prevailed with him to iay.that aside, and to apply himself to the writing of a history of England He proceeded to sketch out some short characters as materials, which are in his” Reliquiae," but proceeded no farther. Life by Walton, Biog. Brit. Life by sir Egerton Bry<1ges in the Bibliographer, vul II. Burnet’s Life of Bede'. Has wood’s Alumni Etonenses. Topographer, vol. 1.